The pond on the property. This is a one of a kind property in scenic Patrick County. This 742 acre tract of land would be excellent for development or your private hunting reserve nestled in the Blue Ridge Mountains of Virginia. One of the long-range views. This 742 acre wooded tract in scenic Patrick County has something to offer everyone. From it's gently rolling hills to it's long range views, this tract has it all. The tract has a professional timber cruise and it totals over 6,000,000 board feet of timber. The tract is all wooded and there are miles and miles of private roads on the property. The tract is abundant with all types of wild life and would make a great private or commercial hunting reserve. Most of the land consists of rolling hills and would make be an excellent tract for a development. There is road frontage on two state road with private roads leading into the property from both state roads. There are several spings and streams on the property as well as a stocked pond. There is also an old homeplace on the tract, which makes an excellent hunting tract. A old tobacco barn on the propery. A barn on the property. Another one of the steams on the property. Take a drive through the woods. A old stone chimney on the land. A newly graveled road into the property. There are several streams on the property. A old homesite on the property. A aerial view of the property. A topo map of the property. 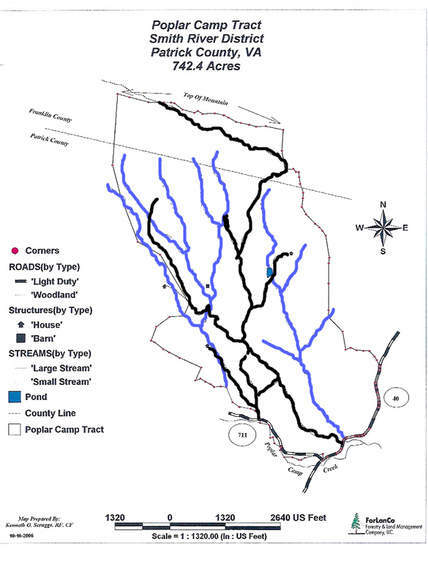 A map showing the creeks and roads.